David Weir was born without the use of his legs, and not only learned from an early age to cope with his disability, but defied his limitations to become a great wheelchair racer and national hero. Here he sheds light on his journey from frustrated schoolboy to Paralympic athlete and champion, and reveals how instrumental the 2012 Paralympics were in transforming attitudes towards disability – not only in Britain but around the world. 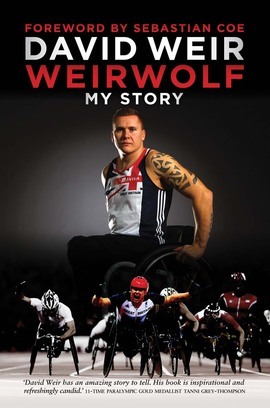 Weirwolf is the extraordinary inside story of the man who won a total of six gold medals at the 2008 and 2012 Paralympic Games, and who is six-time winner of the London Marathon. It is an inspirational tale of the fight against discrimination and the desire to change the face of sport. David Weir talks candidly about his incredible and inspirational life. You think you know David Weir but, of course you don’t. But you will be rewarded with an insight into what makes this remarkable athlete tick after reading his compelling story.